Like many LGBT travelers, we’re big fans of the opportunity to explore each local cultures’ food and drink. So for a day in Dubrovnik, we stepped off the lovely Azamara Journey and indulged in a Azamara Shore Excursions tour to a small working farm just outside the city. They produce olive oil and wine to sell, and vegetables for their own use. Speaking good English, the farm’s owner demonstrated the old method of first press and second press olive oil production, using his own 30 year old horse (we’d never seen olive oil pressed by any method—and after seeing it done in such a rustic manner we’ll forever pretend this is how the grocery store oil back home was pressed). The farmer’s wife then hosted our group for lunch: homemade prosciutto, salad greens, vegetables and olive oil, local cheese and wine from their vineyard—served at tables in their backyard overlooking the Adriatic Sea. Simple and decadent for all our senses. The beautiful food of Dubrovnik. Our guide, Natasha, pointed out an island off the coast which was first developed by the Benedictines, who were then expelled by Napoleon. Upon expulsion they were said to have dripped candle wax all around their compound and left candles upside down in the earth. The curse meant that anyone who had control of the Island would eventually die a non-natural death. The curse would only be lifted when every bit of the candle wax was removed. Beautiful, but we decided not to look for a vacation home there…just in case. The tour continued with time in the old city. Compared to many European cities we’ve visited, many Dubrovnik building façades seemed decidedly basic. 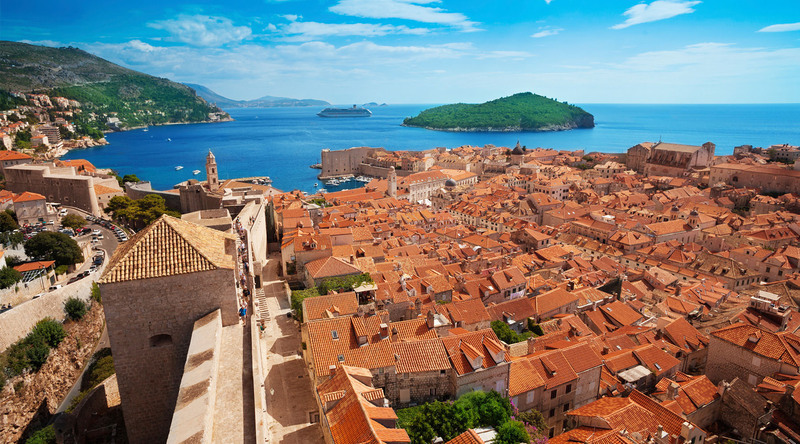 Our guide explained that after essentially freeing themselves from outsider rule [in the 14th Century], the City-State of Dubrovnik became wealthy. However, the custom was to conceal wealth as a way to avoid repeated aggression from outside powers. Ambassadors were instructed to live and dress simply when abroad. City architecture used sandstone because it was non-flammable, local and cheap, and thus not showy. This is the kind of destination immersion we love, and a well-vetted tour company made it fascinating.